Definition at line 163 of file pathunix.c. Definition at line 153 of file pathunix.c. References c, p, and path_delims. Referenced by as_path_delim(), and path_build(). 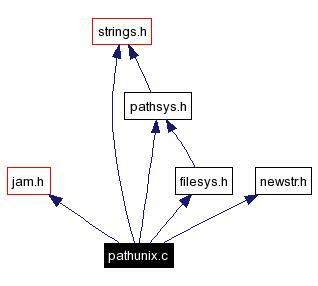 Definition at line 186 of file pathunix.c. References as_path_delim(), f(), file, file_build1(), is_path_delim(), PATHNAME, string_append_range(), and string_push_back(). Referenced by builtin_glob_back(), file_dirscan(), search(), search_for_target(), timestamp(), var_edit_file(), and while(). Definition at line 258 of file pathunix.c. Referenced by timestamp(), and var_edit_file(). Definition at line 56 of file pathunix.c. References end, f(), file, p, and PATHNAME. Referenced by builtin_glob_back(), search(), search_for_target(), timestamp(), and var_edit_file(). Definition at line 142 of file pathunix.c.